TORRANCE, Calif., April 23 -- Toyota Motor Sales (TMS), U.S.A., Inc., announced manufacturer's suggested retail prices (MSRP) today for all 2005 Corolla and Corolla Matrix models, including the all-new performance-driven Corolla XRS. All 2005 Corolla and Corolla Matrix models arrive at dealerships at the end of April. For 2005, the popular Corolla compact sedan receives several enhancements, inside and out. All Corolla sedans receive a restyled front fascia that includes a newly designed front bumper, grille and headlamp along with restyled rear tail lamps. In addition to these styling changes, the value- driven CE and the premium LE receive new wheel cover designs. The sporty S grade receives an aggressive new front spoiler and fog lamps, and smoked headlamp masking. Inside, the Corolla LE will now have Lexus-like Optitron center cluster meters and fabric-covered sunvisors and center console lid. New options for all 2005 Corolla sedan models include side curtain airbags (including seat- mounted side airbags), and vehicle stability control (VSC). A JBL audio system with eight speakers is available on the LE grade. 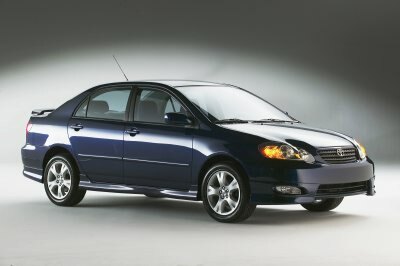 The 2005 Corolla CE sedan carries a base price of $13,680 for models equipped with a five-speed manual transmission and $14,480 with a four-speed automatic. Prices for both models represent an increase of $110, or 0.8 percent. The MSRP for the sporty S grade equipped with a five-speed manual is $14,725, an increase of $110, or 0.8 percent. The S grade automatic is priced at $15,525, an increase of $110, or 0.7 percent. The all-new Corolla XRS combines sporty styling with aggressive handling that is aimed at young performance-driven buyers. "With the popularity of the Corolla S, the logical next step was to match its sporty styling with a performance-driven powertrain," said Don Esmond, Toyota Division senior vice president and general manager. "We expect the XRS to follow the course started by the S grade by appealing to younger customers, with an increase in single male buyers." The Corolla XRS is powered by a newly tuned version of the 2ZZ dual overhead cam engine and six-speed manual transmission found in both the Celica GT-S and Matrix XRS. The 1.8-liter four-cylinder produces 170 horsepower at 7,600 RPM and 127 lbs./ft. of torque at 4,400 RPM and delivers broader and stronger mid-range torque than the previous versions of the 2ZZ engine. And, it features a VVTL-i variable valve timing and lift system that produces a supercharged-like rise in power from 6,000 to 7,600 RPM. The result is a compact sport sedan that blends sub-eight-second zero-to-sixty acceleration with exceptional throttle response throughout its broad power band. Despite the increase in power, fuel economy is hardly compromised with EPA ratings at 25 miles-per-gallon in the city and 32 on the highway. The XRS features a sport-tuned suspension that includes a sport strut tower brace. The strut tower brace is mounted between the shock towers to produce improved ride and handling without compromising NVH. In addition to the sport strut tower brace, the XRS features increased rate coil springs and shocks on all four wheels for improved roll and pitch, and a ride height that is a full half-inch lower. The suspension stands on larger 16-inch aluminum alloy wheels and Michelin performance tires, an upgrade from the standard 15-inch wheels on all other Corolla grades. The revised steering system features a more rigid steering column, producing less vibration and improved response. A power steering rack specially developed for the XRS allows for better steering feedback. The improved performance of the Corolla XRS is accompanied by an array of standard performance-themed styling and convenience enhancements including a rear color-keyed spoiler, sport seats, a color-keyed bezel surrounding the grille, silver-colored instrument cluster and switch plates, optitron meters, a leather-like shift boot with a leather shift knob, and unique badging. Additional standard equipment includes anti-lock brakes with tire pressure monitors, front and rear disc brakes, and cruise control. The outstanding performance and styling of the Corolla XRS is matched by its excellent value with a base MSRP of $17,455. The sporty Matrix combines the style and fun of a sports coupe with the room and utility of a small sport utility vehicle all for the price of a compact sedan. Matrix is available in three grades; the value-driven Standard model, the core XR, and the performance-oriented XRS. For 2005, Matrix exterior enhancements include a new front bumper and grille that conveys a feeling of aggressiveness. In the rear, new clear lens combination lamps provide a sportier appearance. New wheel covers on the XR grade add to the sporty theme. Newly added standard features on the inside include a lever-type seat height adjuster, sliding sun visor, UV cut glass, and a new audio head unit design with a separate clock display. New options for Matrix include curtain shield airbags (with side airbags), VSC and a JBL audio system with CD changer (XRS grade only). The MSRP for the two-wheel-drive (2WD) Standard Matrix increases by $90, or 0.6 percent. The Standard Matrix with a five-speed manual transmission is $14,760, while the four-speed automatic begins at $15,560. The MSRP for the four-wheel drive Standard Matrix with an automatic transmission is $17,295, an increase of $180, or 1.1 percent. The MSRP for the 2WD XR five-speed begins at $16,240, reflecting an increase of $60, or 0.4 percent. Pricing for the 2WD XR automatic starts at $17,070, an increase of $90, or 0.5 percent. The 4WD XR automatic is priced at $18,635, and increase of $190, or 1.0 percent. Pricing for the premium 2WD Matrix XRS with a six-speed manual transmission remains unchanged at $18,750. Pricing for all Matrix models reflects an average increase of $94, or 0.6 percent.